My wife, Cindy, and I at a book signing event. SMART RHINO PUBLICATIONS opened for business in February 2012 ... and we still have the momentum! We now have 12 books in print. And next year looks to be just as productive, if not more so. Although we're known primarily for our anthologies, (Zippered Flesh, Zippered Flesh 2, Uncommon Assassins, Insidious Assassins, Someone Wicked), we have also branched out into publishing novellas (Green Tsunami, and soon The Box Jumper) and novels (The New Adventures of Tom Sawyer and Huck Finn). And to give folks a taste of my own writing, we published a collection of five of my stories, Broken: Stories of Damaged Psyches. Our mission has always been to provide a venue for our authors and their quality work, and we promote them whenever and wherever possible. Become their fans! Buy their books! If you want to keep up with Smart Rhino events, read author interviews, and perhaps learn a little more about the writing profession, be sure to sign up for our occasional e-letter. (Don't worry, we won't bombard you with email!) You can find the sign-up option in the right-hand column of this page. And we love to hear from our readers! If you'd like to leave a message for us, simply click on "Contact" in the header and use our handy email form. Thank you! Here is the current catalog of Smart Rhino books, starting with the most recent and working back through the years to our "virgin" project, ZIPPERED FLESH. A maintenance technician in Alaska, an English thief, a young couple on a road trip across America, an astronaut on a one way ride to Jupiter, an Irish gravedigger, and dozens more. All victims of an otherworldly infection, all tormented by a plague of shadows. This anthology includes stories and poetry by the members of the Written Remains Writers Guild, as well invited, renowned guest authors. 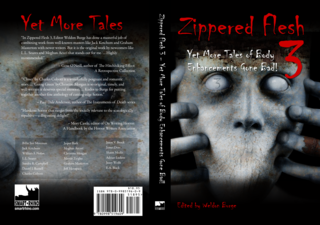 The third in the "Zippered Flesh" series of anthologies, with stories by Graham Masterton, Jack Ketchum, William F. Nolan, Billie Sue Mosiman, L.L. Soares, James Dorr, Jeff Menapace, and 12 other incredible horror/suspense writers. Lisa Mannetti's incredible novella focuses on Houdini and his confrontations with fraudulent psychics and mediums of his day, told by his "box jumper" (a magician's assistant who seems to "jump" from box to box onstage), Leona. This sequel to UNCOMMON ASSASSINS has suspense stories by Joe Lansdale, Jack Ketchum, Billie Sue Mosiman, Joseph Badal, and 20 other incredible writers. An apocalyptic horror novella by L.L. Soares and Laura Cooney, with illustrations by Dan Verkys, Will Renfro, Ju Kin, and Justynn Tyme. In this wonderful novel by Lisa Mannetti, Tom and Huck have reincarnated as two white cats, and they are now familiars for a modern day witch. Of course, they want to be boys again! Available in Adult and YA editions. Someone Wicked is the second anthology produced by the Written Remains Writers Guild, and contains stories by both Written Remains members and a number of friends of the guild. 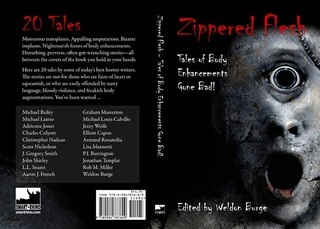 The anthology contains 21 stories, ranging from horror to suspense to fantasy to bizarro fiction. This sequel to ZIPPERED FLESH includes two stories that were nominated for the Bram Stoker Awards: "The Hunger Artist" by Lisa Mannetti and "Primal Tongue" by Michael Bailey. I had fun editing this one! This is a collection of five horror/suspense stories by Weldon Burge, designed as in introduction to his work. The first in the "Assassins" series of suspense anthologies, UNCOMMON ASSASSINS focuses on hired killers, vigilantes, assassins--but these are not ordinary killers, not your run-of-the mill hit-men. The emphasis is on the uncommon here! This is the first anthology published by Smart Rhino Publications, and still one of the favorites for readers. The horror stories are not for the squeamish! The antho contains 20 stories from some of today's best horror writers, includnig Graham Masterton, Lisa Mannetti, John Shirley, Scott Nicholson, L.L. Soares, and several other names you're sure to recognize.